Caius Chapel has a claim to being the oldest purpose-built College Chapel in Cambridge still in use. The core of its walls dates from about 1390 and every century since has contributed something to the building. In 1348, Gonville Hall was founded and dedicated to the Annunciation of the Blessed Virgin Mary by Edmund Gonville, Rector of Terrington in Norfolk, by a licence of foundation obtained from Edward III. His work was continued by his executor, William Bateman, Bishop of Norwich, who moved the College to its present site (from what is now part of Corpus Christi College). He did this deliberately to place this College and his other foundation of Trinity Hall as near the centre of the University as possible. A permanent licence to celebrate the Divine Offices here was granted by Pope Boniface IX in 1393, at which point the Chapel was first completed. In 1557-1558, the College was refounded as Gonville & Caius College by Dr John Caius, by a charter of foundation and confirmation obtained from Philip and Mary, King and Queen of England and Spain. Dr Caius had preserved the pre-Reformation Chapel ornaments, furnishings and books, although these were destroyed in a fit of vandalism in a bonfire in Gonville Court in 1572. Two books survived this burning and are now in the College Library. The original Chapel was 68 feet long. It is now over 100 feet long, the first major extension taking place in 1637. A fund was opened in 1716 for the repair and improvement of the Chapel. The stone facing on the exterior walls dates from this period and from 1870, when the east end was substantially rebuilt in Byzantine style and the whole building extensively refurbished by Alfred Waterhouse. Before Dr Caius, all the Masters of the College had usually been priests, and the gallery, where the organ now stands, was the Master's private oratory. The piscina (a shelf used during the celebration of Mass) can be seen high up on the south wall of the gallery. The brass on the north wall of the Antechapel, taken from the slate tomb on the floor, is probably of Sir John Lestrange, who died in 1518. Another brass on the floor in front of the door commemorates Walter Stubbe, Fellow, who died in 1514. Both these men were buried in the Chapel soon after permission for interments was granted by Pope Alexander VI in 1500. Four Masters and another Fellow, who died between 1764 and 1852, are also buried in the Antechapel. The two other large monuments were built in similar style to Dr Caius' tomb, both seeming to mirror the Gate of Virtue built by Caius in his new court which bears his name. On the south side is the monument to Dr Thomas Legge, a Roman lawyer who practised in the Church courts and who succeeded Dr Caius as Master, dying in 1607. His monument was built about 1619 by Dr John Gostlin, Master from 1619 to 1626 and a devoted friend ~ Gostlin's heart is shown being offered to Legge on the monument. The monument next to Legge's is to John Gostlin's great-nephew (also called John Gostlin and also a medic), President of the College for 25 years before his death in 1705. On the north side is the large monument to Dr Stephen Perse, who died in 1615, founder of the Perse School in Cambridge, Fellow and a great benefactor of the College. The small monument next to Perse's is to William Webbe (died 1613), nephew of Dr William Branthwaite, the Puritan Master who is also buried without monument in the Chapel, in between Caius and Legge. Due to Dr Caius' fine reputation in medicine (which the College still maintains) and the religious tolerance of Legge and Gostlin, Caius became a very popular college. In 1637, the Chapel had to be extended; and the present ceiling was erected in Laudian style under the influence of John Cosin, ex-Fellow of Caius and Master of Peterhouse, later Bishop of Durham. The cherubs on the ceiling were removed by the Parliamentarian iconoclast William Dowsing in 1643, but were replaced after the Restoration in 1660. In this period, the windows were replaced and the stalls constructed. On the south wall, there is an elaborate eighteenth-century monument to Sir Thomas Gooch, Master of Caius, Bishop of Bristol, then of Norwich, then of Ely, who also had three wives. The current gallery dates from 1870. The entire apse at the east end dates from 1870. Its Byzantine style contrasts with the rest of the Chapel. Behind the altar, five mosaics by Salviati depict incidents from the Bible involving teaching - the prophet Samuel being tutored by Eli; the finding of the scroll of the Law in the Temple by Josiah; the boy Jesus disputing with the scribes in the Temple; Jesus teaching Martha about eternal life near the tomb of Lazarus; and Eunice instructing her son Timothy. The stained glass in the windows above reflect the College's dedication (the middle window shows the Annunciation) and the College's long medical tradition (the four other windows depict scenes of healing by Christ and the Apostles). The mosaic at the top of the apse continues this theme of healing, showing Christ in glory surrounded by his disciples, with the Greek text "Come unto me all that travail and are heavy laden, and I will refresh you." There is more fine nineteenth-century stained glass in the body of the Chapel. On the south wall can be found scenes from the life of St Paul, commemorating the Revd Anthony Steel (died 1885), the first married Fellow of the College. Also represented is St Augustine of Canterbury's mission to England, commemorating Dr Edwin Guest (died 1880), Master. On the north wall we find Christ healing a paralytic, flanked by St Luke and St Nicholas, commemorating Sir George Paget (died 1892), Regius Professor of Physic. Also depicted are three of Christ's appearances after the Resurrection, to St Mary Magdalene, to Cleopas at Emmaus, and to St Thomas, commemorating George Romanes FRS (died 1894), Honorary Fellow. The monument to Sir Hugh Kerr Anderson, Master 1912-1928 and neuro-physiologist, is on the north wall at the east end. The War Memorial tablet is on the north wall at the west end. The names of all members and staff of the College who lost their lives in the First and Second World Wars are carved on the east wall of the Antechapel. The organ was entirely rebuilt in 1981 by Johannes Klais of Berlin. The Chapel was originally used for many purposes: College meetings and examinations were held here. Today, the Chapel is the focus of the College's religious life and aims to present Christianity credibly to the members of the College. Worship in Chapel is regulated by the Universities Tests Act 1871 which specifies that services must be held according to the use of the Church of England. The Dean, who is responsible for the daily running of the Chapel, is always an Anglican priest, although people of many denominations and faiths regularly attend worship. There are normally ten services each week during the University term, with two sermons. 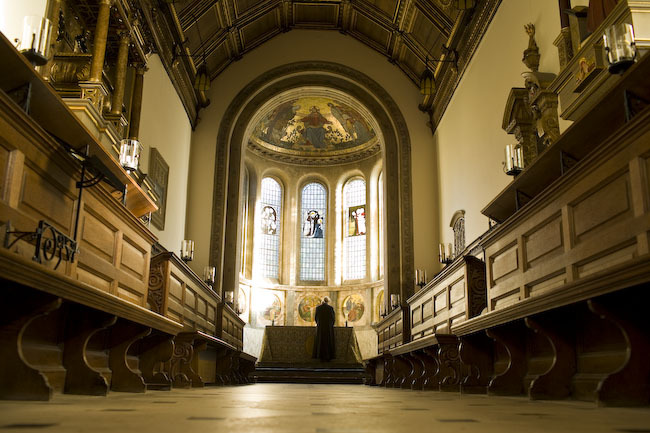 Caius maintains a strong choral tradition and three of the weekly services are sung by the Choir, which is composed of students who are mainly also choral exhibitioners. The admission of a Master or of Fellows or Scholars always takes place here, and the Chapel is often used for musical concerts and recordings. Details of services may be found in the sheets in the pews. Visitors are always most welcome to attend any service in Chapel.